You probably know the feeling - lying in bed for hours on end looking at the clock with the mind swirling, chattering and generally keeping you from falling asleep. You re-play the events of the day getting caught in circular thoughts like “Why did I say that?”, “Why didn’t I stand up for myself at work?”, or “How am I going to pay my bills?”. The frustration of insomnia spills over into the next day and you find yourself reaching for another cup of coffee to make it through the day. One in four Americans experiences insomnia every year, with 75% of those sufferers recovering without developing chronic insomnia (1). For cancer patients, the stress of diagnosis and treatment can be cause for greater insomnia. In fact, recently treated cancer patients are twice as likely to develop sleep disturbances as the general population (2). It is not only the swirling stressful thoughts that keep patients awake, but muscle and joint pain may prevent them from finding comfort and achieving deep restful sleep. Many steroidal cancer medications can also cause insomnia, and patients often need prescription sleeping aids to overcome it. Regular sleep is so important to every aspect of life, from physically feeling better to be able to think more clearly. From being in a better mood to being able to heal more quickly. Sleep enhances immunity at the cellular level allowing immune cells to be created and tissue to be repaired. Unfortunately, stressful sleep-less nights have both and an immediate and long-term detrimental effect on the health of the immune system. (3). For cancer patients or people whose immune systems are already compromised by treatments, sleep is an important part of supporting the body’s natural healing processes. But how do we get better sleep? There are many ways to increase sleep hygiene including maintaining a set bedtime, creating a relaxing pre-sleep routine like taking a hot bath or drinking herbal tea, limiting light and electronic devices in the bedroom, and creating a warm inviting sleep environment. Yoga practices can also help improve sleep and over 55% of yoga practitioners report that yoga helps them sleep better (4). Specifically, we will be looking at practices that activate the parasympathetic nervous system, or “rest and digest” response. This part of the nervous system counteracts chronic overstimulation of the sympathetic nervous system, or “flight or fight” response caused by living in the modern world. The yoga practice that follows is a combination of practices to enable easier sleep. 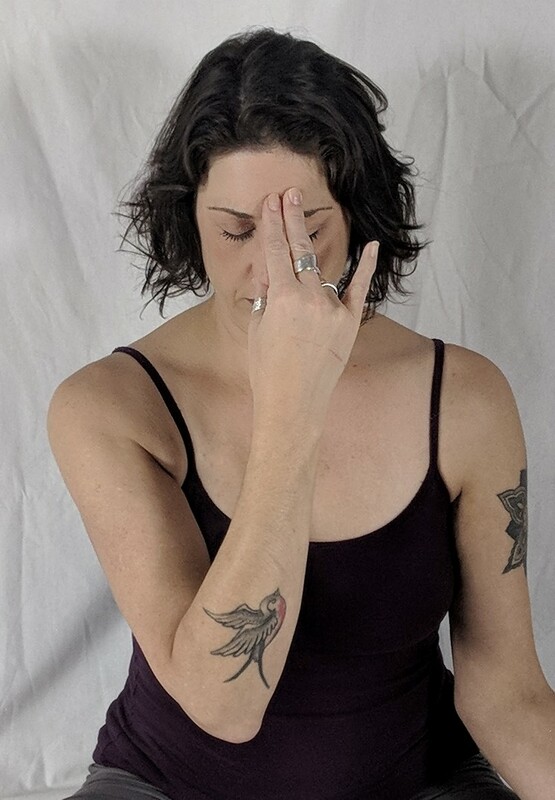 It consists of mudra to help quiet the late-night ruminations of the mind, gentle spinal movements to ease body aches, calming pranayama to release stress, and a mild inversion to initiate the relaxation response. Practice in the hour before you go to bed to take advantage of the sleep-inducing benefits. Do a little yoga each day to give yourself the time and space to heal. Make yoga a permanent part of your life after cancer. Stay mindful of the body and breath throughout the practice. Only move in a comfortable range of motion. If you become uncomfortable, dizzy, nauseated or breathless, stop immediately and rest for a few moments. For this practice, a yoga mat and two soft props (bolsters, blankets or pillows) will be helpful. Stating an intention, or Sankalpa, is an important first step toward using yoga as a healing practice. 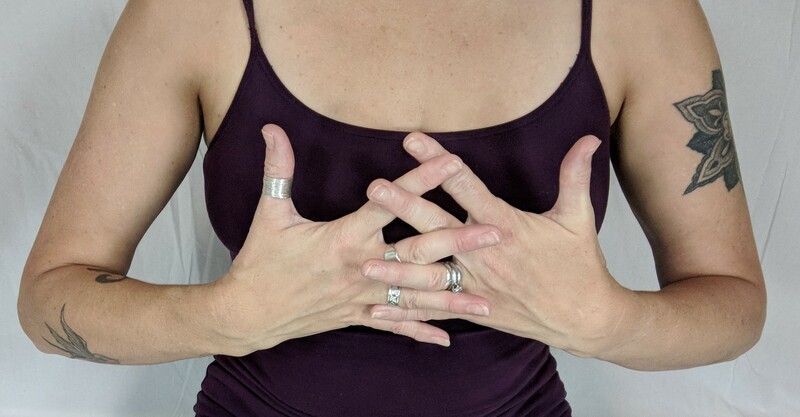 Combining intention with the following mudra that settles doubts by enhancing your ability to trust yourself can serve as a reminder of your goals during this time. Begin sitting in a comfortable seated position. Clasp your hands together with your fingers on the outside. Open your palms towards your chest so that your thumbs reach upwards towards the ceiling. Loosen the webbing between your fingers and hold your hands in front of your heart center and notice the physical and energetic effects of this gesture. Hold the mudra for a few more breaths, then release the hands. When a stiff and achy body contributes to sleepless nights, movement is often needed to release tension, ease pain, and relax muscles so that sleep can come more easily, especially if you experience occasional restless leg syndrome or cramping at night. Try this simple effective series of movements that can be done on the floor or reclining in bed. As you inhale extend your legs making sure that you do not feel the strain in your lower back. If you feel a strain, keep your knees bent and your feet on the floor. As you exhale draw your right knee towards your chest with your hands clasped in front of your shin, as shown. Then as you inhale extend your right leg back to the floor and either relax your arms to your sides or reach them over your head. As you exhale and inhale again, repeat the movement with your left leg. Alternate sides for five or more repetitions, relaxing into a flowing pattern with your breath. 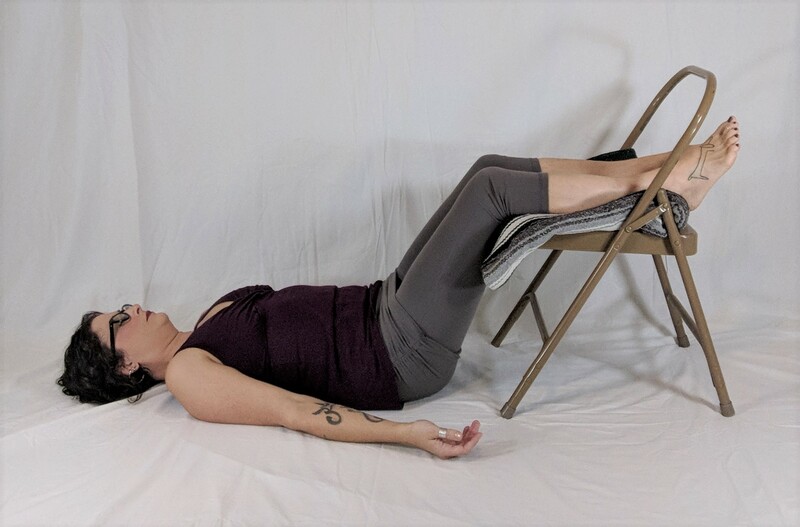 A gentle twist can be helpful for releasing muscular tension from the hips and lower back which may help you to be more comfortable when you recline to sleep. Try this version on the floor or on top of your bed. Recline on your back with your knees bent and your feet on the floor. You may find it helpful to place a bolster or block on the right side of your hips. Press your feet into the floor and slightly lift your hips up so that you can shift your hips a few inches to the left, then lay your hips back down. Draw your knees towards your chest and relax your legs to the right, using the prop under or between the knees as needed to keep both of your shoulders on the floor. Breathe into the left side of your abdomen and chest as you rest in this position up to 3 minutes. To come out of the posture, draw your left knee up followed by your right so that you are resting on your back again. Then place your feet on the floor and repeat the twist to the other side. A gentle forward bend shares the tension-relieving benefits of the reclining twist above as well as calming mental and emotional energy that can help to prepare the body and mind for sleep. 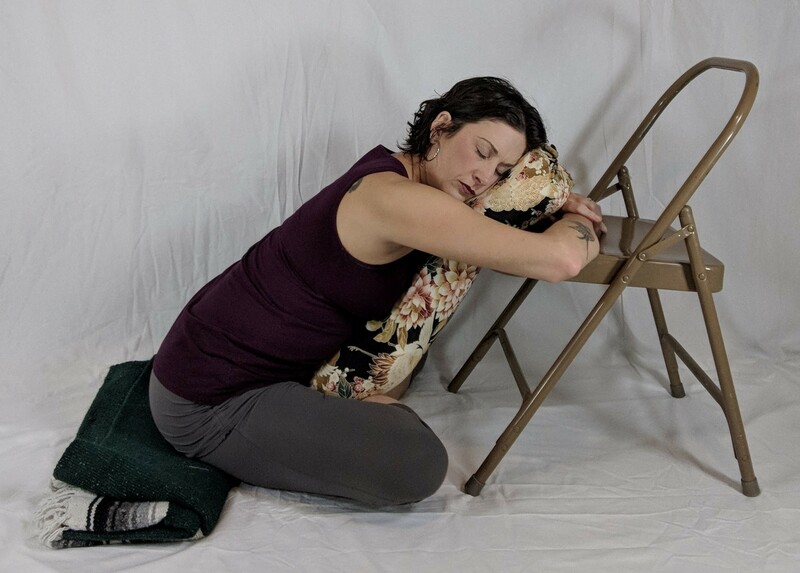 Try this version with the head supported by a chair to ensure a sense of surrender and ease. Sit cross-legged in front of a chair seat using a folded blanket or bolster under your sit bones if it assists your ability to tilt your pelvis forward. Lengthen the front of your spine and place a bolster along the front of your body for support. Then lean forward from your hips and rest the bolster against the front edge of the chair seat. It may be more comfortable to turn your head to one side (as shown) and rest your arms on the seat, making sure to change the turn of your head half-way through the pose. Otherwise, you could place your forehead on your stacked hands, or rest your arms down by your sides. Rest in this position for up to 3 minutes so long as your hips and legs are comfortable. Breathe into the back of your body inhaling up your spine and exhaling down your spine. To come out of the posture, engage your lower belly and draw your torso back upright. Repeat the posture with your other leg crossed on top. Notice that the leg that is on top or in front receives the most stretch in this pose. Different breathing patterns create different effects and here you will practice pranayama that can calm a swirling mind. In this pattern, you will breathe in through the left nostril which activates Ida Nadi. This left pranic channel is often called the moon channel and is cooler, calmer and more introspective than the right channel. You will then exhale through the right nostril which is associated with pingala nadi, the more active or solar channel. Imagine that you are allowing calming lunar energy to flow through your active busy mind. Begin seated comfortably and place the index and middle fingers of your dominant hand at the spot between your eyebrows. Use your thumb (or ring finger if you are left-handed) to close your right nostril and inhale through that side. Then use your ring finger (or thumb if you are left-handed) to close your left nostril and exhale through that side. Hold your breath out comfortably for a few seconds. Continue breathing with this pattern, inhaling through your left nostril and exhaling through your right nostril with slight pauses at the top of the inhalation and bottom of the exhalation. Can you feel that the inhalations are cooler than the exhalations? Notice the effects of this breath as you continue for a few minutes. When you are finished, spend a few moments relaxing the breath back to its normal everyday pattern. Elevating the legs before you go to sleep can help in several ways. It will relax the lower back and help to release deeply-held tension in the hips. The mild inversion also shifts the flow of blood from the feet towards the heart and sends a signal to the parasympathetic nervous system to activate the relaxation response. It takes some time for this internal shift to occur, so rest here for as long as you feel comfortable. Find a piece of furniture in your home such as a soft chair, sofa seat or ottoman that you can use for support. You might use the side of your bed or even lie with the feet up on your headboard. Recline in front of your support and place your calves on the seat, supporting your head with a folded blanket or pillow if needed. Completely relax your legs and rest your arms slightly away from sides with the palms facing up. Rest here for at least ten minutes. If you do not want to fall asleep in this position, you might want to set a timer. Also, make sure that you are warm enough, wear socks or cover yourself with a blanket. When you are ready to go to bed, take your time rolling over to your favorite side, resting there for a few moments while you repeat your sankalpa from the beginning of the practice. Then use the strength of your arms to press yourself back up to a seated position. Namaste'. Study more about this topic with YogaUOnline and Tari Prinster - Introduction to Yoga for Cancer: Tapping Into the Body's Inherit Healing Wisdom. Cheryl Fenner Brown, C-IAYT, ERYT 500 works with cancer patients and people over 50 in central North Carolina. 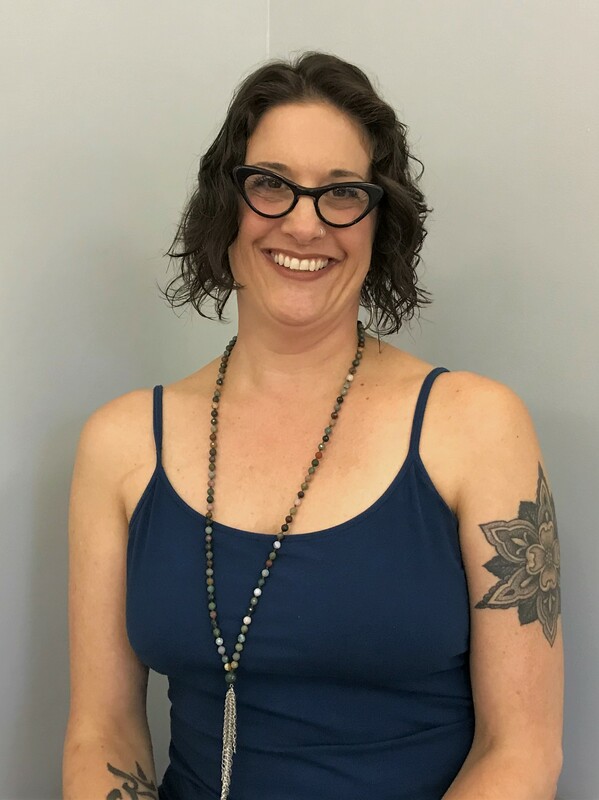 Her 700-hr Hatha training at Piedmont Yoga Studio and 1000-hr Integrative Yoga Therapy training inform her unique blend of alignment principles with subtle energy work, sound, mudra, and yoga nidra. She teaches classes, privates, self-care retreats and enjoys mentoring teachers in a 100-hr Adaptive Yoga Mentorship. Her Healing Yoga for Cancer Survivorship DVD is based on her feasibility study presented at IAYT's Symposium on Yoga Research and the Society of Integrative Oncology's annual conferences in 2015 and highlighted in Yoga Journal. From this work she developed a 50-hr Healing Yoga for Cancer teacher training that is offered nationwide, find out more at www.yogacheryl.com. 2. Fiorentino, L., & Ancoli-Israel, S. (2007). Sleep dysfunction in patients with cancer. Current treatment options in neurology, 9(5), 337-46.